Noma’s victory at the S. Pellegrino World’s 50 Best Restaurants last night is a triumph both for the Copenhagen eatery and for the awards, which were stuck in a rut, handing out first place each year to El Bulli. 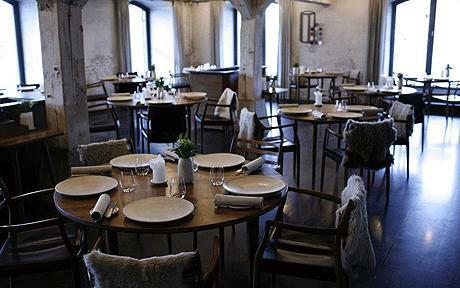 Danish chef Rene Redzepi was there to collect the crown that had gone for the past four years to Ferran Adria for his establishment north of Barcelona. El Bulli has been in the top three every year since the awards were founded in 2002. Heston Blumenthal’s Fat Duck has been the other big winner, coming first in 2005 and always making the top three since 2004. The U.K. restaurant came third last night, behind El Bulli. The only other winner has been the French Laundry, in 2003 and 2004. 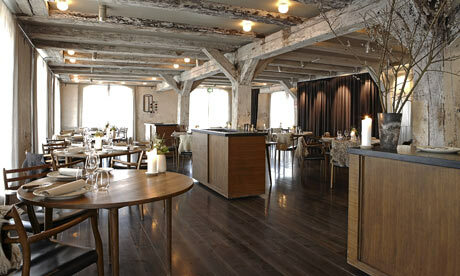 Noma, which seats 42 diners, was founded in November 2003. The S. Pellegrino World’s 50 Best Restaurants were named at a reception in London’s Guildhall attended by chefs and restaurateurs including Daniel Boulud, whose New York flagship surged 33 places to No. 8. The awards started as a magazine feature and have grown to international prominence. 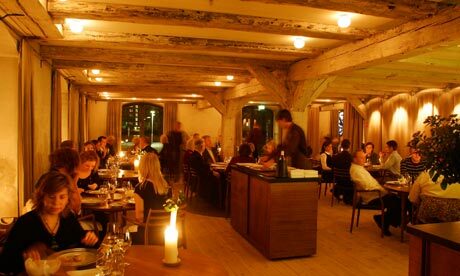 Noma -- which stands for Nordisk Mad, or Nordic Food -- is housed in a converted warehouse by the waterside in the Danish capital’s Christianshavn district. Redzepi, 32, travels the region in search of ingredients and culinary inspiration for his seasonal menu. Noma entered the table at 33 in 2006 and had risen to third by last year. “When I first got an invitation saying, ‘Congratulations, you are now on the 50 Best Restaurants list,’ I’d never really heard about it,” Redzepi said in an interview at Noma in February. “But immediately after the award show, you realized it was something special by the press coverage, the phone calls. El Celler de Can Roca and Mugaritz, both in Spain, took fourth and fifth places. The highest U.S. entry was Alinea, of Chicago, in seventh place. New York restaurants Daniel, Per Se and Le Bernardin, took eighth, 10th and 15th, respectively. The London winners were St. John, at 43, and Hibiscus, at 49. Adria was chef of the decade, and the chefs’ choice award went to the Fat Duck. La Colombe, Cape Town, was top in Africa and the Middle East; D.O.M. of Sao Paulo came first in Latin America; and Les Creations de Narisawa, Tokyo, topped Asia. Gordon Ramsay failed to make the top 100 for the second straight year. The British chef’s former associate, Marcus Wareing, came 58th with his restaurant at the Berkeley. The winners are picked by more than 800 chefs, food writers and restaurateurs from around the world. I’m a member of the U.K. panel and each of us votes confidentially, without meeting -- or even necessarily knowing the identity of -- the other panelists. The U.K. and Ireland panel is headed by Jay Rayner. Members of the voting academy are required to have eaten in the restaurants we nominate within the previous 18 months and we have to vote for at least two places outside our own region. Everyone knows the list is imperfect. Asia is historically underrepresented, while the Top 10 includes four restaurants in Spain and not a single one in France. There’s no controlling hand behind the World’s 50 Best and -- even though I’m a voter -- I’ve found myself checking the names of places in Russia, Slovenia and Croatia that have made the Top 100 this year. The awards started in 2002 as a feature in “Restaurant,” a U.K. publication founded the previous year. The writer Joe Warwick said he sent e-mails to journalists and chefs to pick their favorite places, like a music magazine naming best albums. That first year, British venues did suspiciously well: Gordon Ramsay came second and the Ivy took eighth place. El Bulli won. “The next year, we did a little event and, lo and behold, Ferran Adria showed up,” said Warwick, who went on to become the magazine’s editor. “I thought: Hang on, we’d better do this properly, so we came up with the idea of the academy. At the center of Redzepi’s cuisine are fine, seasonal Nordic ingredients: halibut, wild salmon, seaweed and curds from Iceland; lamb, musk ox, berries and the purest drinking water from Greenland, according to Noma’s Web site. While the style is modern -- Redzepi’s resume includes El Bulli and the French Laundry -- the focus is on the produce, not the technique. When I ate there in February, the seven-course tasting menu cost 995 kroner ($180) plus service; matching wines were 895 kroner, or juices 395 kroner; there was a 595 kroner lunch menu. There were six different types of canape, including pickled quail eggs smoked on a bed of hay, and smoked cod roe on toast with vinegar. That’s before we got onto the 10-course meal, which included squid and lingon berries, cream and dill; sour grape juice from the isle of Lilleo, caramelized onions and thyme leaves; beef cheek and pickled flowers and winter cabbage. As I was leaving, Redzepi said he wasn’t sure if he’d be able to attend the awards again this year. “Spring is late and I don’t know if I’ll have time to leave the restaurant: I need to be in the kitchen,” he said. He made it to London last night and was looking very happy.